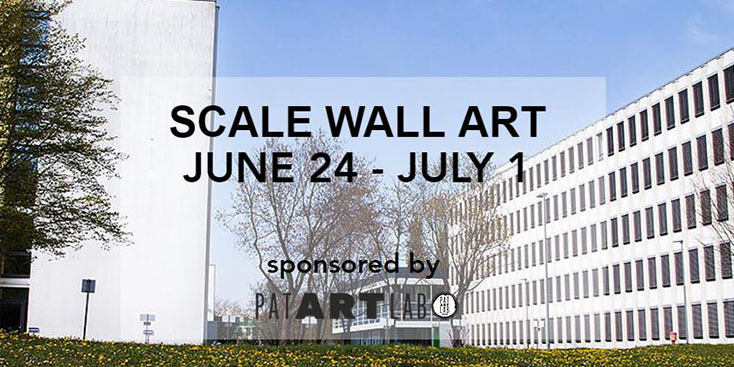 SCALE WALL ART was initiated by PAT ART LAB and will take place from June 24th to July 1st 2017 on the former Siemens Campus in Munich: A few of the worlds most renowned Urban-Art artists are going to create their works within one week on five buildings that are located in one neighborhood right next to each other. The concentration of creativity and large-size works in this dimension in only one place sets standards and is unique in the region. The most important partner of the project is the Patrizia KinderHaus Foundation that builds hospitals, orphanages and schools worldwide since 1999. Edition-Prints of the works will be auctioned after the festival for a good cause. All earnings will be donated to the work of the foundation. The artists of the projects are: OsGemeos (Brasil), Aryz, Okuda (Spain), Axel Void (USA), Sainer/ETAM (Poland), jana & JS (Austria/France) und from Germany: Mirko Reisser (DAIM), Loomit, Daniel Man, SatOne and the legendary artist collective from Munich Stone Age Kids. All participating artists are professionals in creating large-scale works on big building facades: The works conquer the public space, work with and in their urban environment, and intervene in the visual appearances of the city. They enter into an exchange with all the ‘participants’ of a city and can be experienced any day- and night-time with free admission. The venue of the former premises of Siemens, centrally located in Munich Obersendling, creates ideal conditions to achieve this aim: It is extraordinary as an open-air art space: Large-scale walls can be painted top to bottom, the wide space beneath the buildings is breath-taking and creates the possibility to look at the murals as a whole from a distance. Also the walls are very close to each other, so that all artists can work in constant exchange. In that way the close bond between the Urban-Art artists, that is a special characteristic of the scene, will be a central element of this outstanding project.